TROY, Mich. - July 17, 2013 - PRLog -- (Troy, Mich.) - Motor Honey® Oil Stabilizer, Engine Oil Leak Stopper and High Mileage Oil Treatment from Casite® are now available in select Advance Auto Parts stores. Motor Honey products are race-engineered to improve oil viscosity and performance in gasoline and diesel engines, and are compatible with both synthetic and conventional oils. Motor Honey Oil Stabilizer is formulated to increase mileage and power, and lower operating temperatures to help protect against oil breakdown in even the most demanding environments. It is ideal to reduce friction and engine wear, protect engine parts, extend engine oil life, provide stay-in-grade protection, and offers added protection during dry start situations. Motor Honey High Mileage Oil Treatment is designed for all gasoline and diesel vehicles with over 75,000 miles. Formulated to extend engine life, and reduce oil consumption, it protects engine parts to ensure your engine will run better and last longer. Motor Honey Engine Oil Leak Stopper is specifically designed to stop minor leaks caused by hardened or dried-out gaskets and seals in gas on diesel applications. Motor Honey Engine Oil Leak Stopper is compatible with both conventional and synthetic oils. Since beginning its "Show Me Your Motor Honey" Facebook promotion in February, Casite has awarded over $4,000 in prize money to help celebrate the company's 90th anniversary. The promotion began on February 1, and will continue through October. Each month nine lucky contestants are awarded a $90 Visa gift card. One winner in June was Darnell Harris from Jacksonville, Fla. The picture he submitted of himself with his 1974 Pierce Snorkel Fire Truck received a lot of attention and votes. The eight other winners for June are: David Lester, Heather Raymus, Shane Rhabb, Laura Olivo, Rose Redmond, Danielle Collareno, James Cornish, Sharon Ashmore. Vehicle owners who visit the Casite Facebook page have the opportunity to upload a photo of themselves, or a family member, friend, or pet (their Motor Honeys), with their "ride." Contestants and their friends can vote once a day for their favorite photos. Contestants can also upload a photo of a different vehicle once each month through October to increase their chances. Enter to win at www.showmeyourmotorhoney.com. Each of the monthly winners and the top 90 voted entries at the end of the promotion will qualify to win the $9,000 grand prize, which will be announced on November 6 during AAPEX 2013 in Las Vegas. 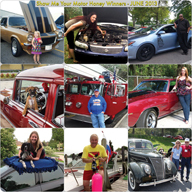 More information regarding the “Show Me Your Motor Honey” promotion, including promotion details, rules, regulations and the list of monthly winners can be found on Casite’s website at www.casite.com. For more than 90 years, Casite has been supplying the global aftermarket with premium automotive chemicals. For more information on The Casite Company, visit http://www.casite.com or call 1-888-CASITE-1. The Casite Company is an automotive chemical company that specializes in the aftermarket. Products sold by Casite include quality fuel additives, professional maintenance liquids and professional cleaning products. Casite offers premium chemicals and products that are engineered to work better and are easier to use for the consumer. Motor Honey is an entire line of performance-enhancing products for a vehicle's engine, transmission and power steering systems to prevent leaks, reduce wear, enhance performance, decrease oil consumption and improve gas and diesel mileage. Casite can be found in national retailers and merchandisers throughout the United States, Canada, Mexico and Puerto Rico and more than 40 countries around the globe.